When you get used to driving, just like with anything else, you could develop poor driving habits. The only problem is that a lack of care behind the wheel can result an unfortunate accident. Not only could a collision raise your auto insurance rates, it could result in injuries or even death to you, your passengers, or others on the road. It’s for this reason that taking a defensive driving class is ideal. If you decide to take a defensive driving class, it’s important to make sure that its not just some fun simulation program and that it is actually approved in your state. 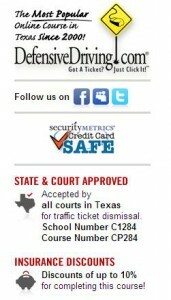 DefensiveDriving.com is approved by the Texas Department of Licensing and Registration (the governing body of all driving safety courses in Texas). We are also approved in many other states. Check with your insurance company for available discounts for taking a defensive driving course. If you think you’re ready to make some positive changes while on the road and make your car insurance company happy (and you too when you see your improved auto insurance rates) then consider taking DefensiveDriving.com’s award-winning online course. You will not regret your decision!